Another page down for Calvinball! 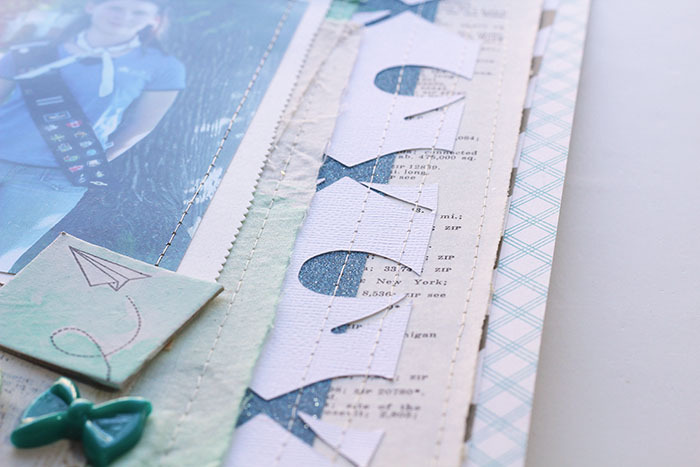 I did lots of layering, stitching, and made my own embellishments for this page. One of the layers is a cut out piece left over from some bows I cut with my Cameo.. I often save these "garbage" bits, because they are a great way to add layers and dimension and texture, from something that is basically nothing! Not much journalling on this page -- none at all, really. Just the facts. That's all some pages need, right? 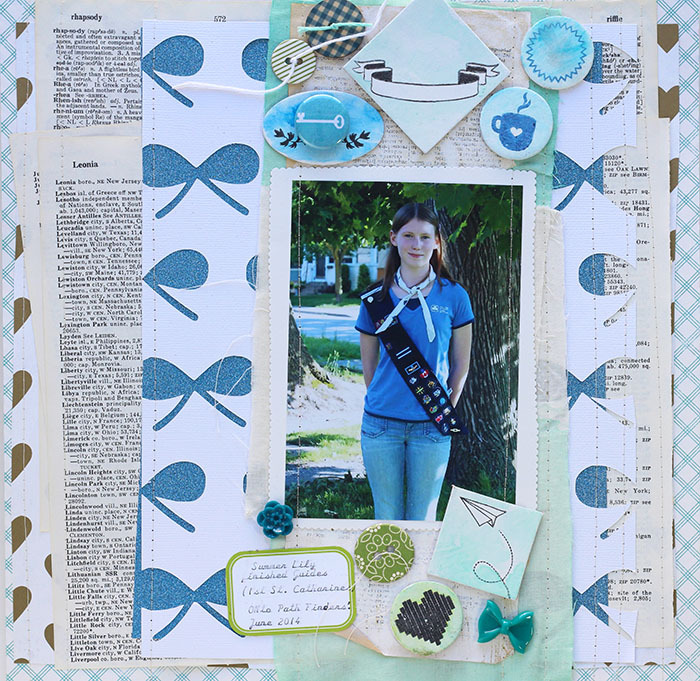 I sewed lots of vertical lines on this layout! 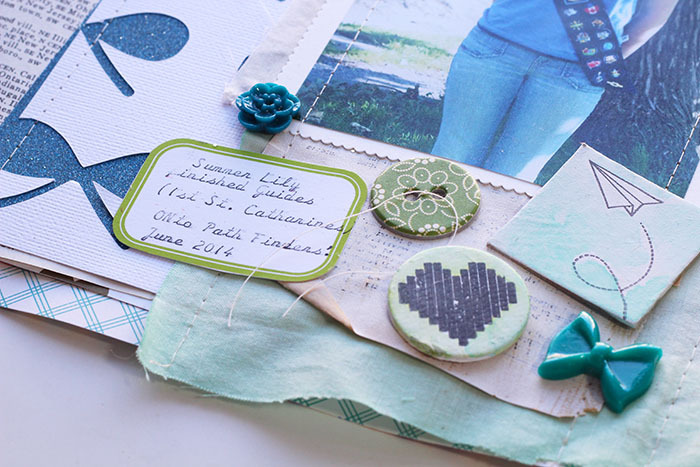 I love the way it reminds me of matchstick quilting, which is so popular right now in the quilting world! 1. 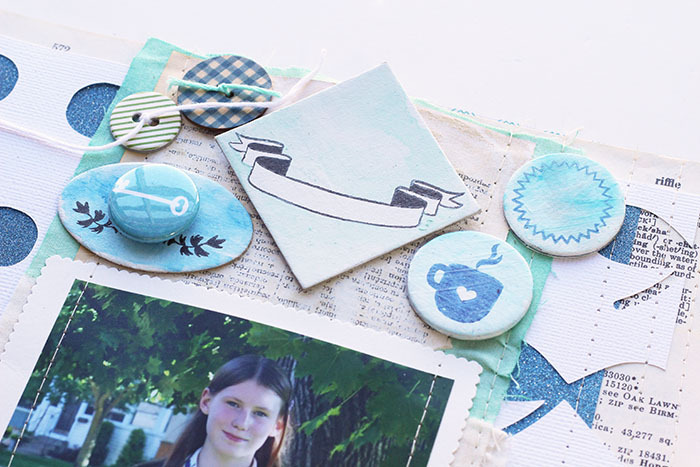 Paint chipboard shapes with gesso. 2. Stamp with a permanent ink, like Staz On, or the Cocoa Daisy hybrid ink pad. 3. Once ink is fully dry, paint pieces with watercolour. 4. You can coat these with matte gel, gloss gel, or a layer of Glossy Accents if you want them a little more finished. I prefered to leave these plain, for this page. Beautiful LO (as always).......(can't believe it's Calvinball time again - I always love seeing Doris's LO's and now I get double the inspiration (well, triple with Jill! )....just need Sian to join in next year and I'll be in heaven!!! )......love the LO....beautiful photo of a beautiful beautiful young lady! Gorgeous use of blue here. I love the collection of accents at the top and bottom of the photo. I see you're also on the road to accruing more Calvinball points -- congrats! Love all those great bits and pieces!